The discovery of the glory of extinct or little known civilizations of the world owes a great deal to European research and scholarship. The spade of the European excavator lent a helping hand to the geologist who divided up time dealing with the physical history of the earth into three main epochs - Tertiary, Quaternary and Recent - in which to fix the period of a particular culture; the paleontologist who examined the fossils of anthropoids (viz. those of Pithecanthropoids, Australopithecines, Heidelberg Man, Piltdown Man, Neanderthal Man, etc.) to determine the mode of man's descent on the earth; and the archaeologist who deciphered artifacts, inscriptions, and monuments to establish the antiquity of civilizations. The interpretation of hieroglyphs on the Rosetta Stone by Young and Champollion opened the sealed book of Egypt’s glorious past. The excavations of M. Botta and Layard in South West Asia yielded sufficient findings on which could be built up the edifice of Assyrian civilization. Likewise, the researches of British indologists such as John Jephaniah Holwell, Nathaniel Brassey Halhed, Alexander Dow, Charles Wilkins, Sir William Jones, Alexander Cunningham and many others culminated in the birth of indology, aimed at a scientific and systematic study of India's past – its history, social and political institutions, literature, language and religion. There were three marked stages in the development of indological studies: the period of curiosity and speculation, the period of appreciation and vilification, and the period of archaeologists. Among the first Europeans who tried to understand India's cultural past were the two eighteenth century Jesuit priests at Malabar -Father Johann Hanxledon who compiled the first Sanskrit grammar in Latin which remained unpublished, and Father Coeurdoux who established a linguistic and ethnic kinship between the Brahmins and the descendants of Noah.1 Much earlier, a Dutch missionary, Abraham Roger, had published a translation of the poems of Bhartrihari,2 and introduced his countrymen to the customs and beliefs of the Hindus with his Open Door to the Hidden Heathendom. But his works failed to generate sufficient interest among the Europeans. Holwell was fascinated by the monotheistic character of Hinduism, its ethics, its doctrine of the immortality of the human soul, its belief in transmigration, its notion of kala (time) its concept of the age of the universe and it dissolution, etc. Both Pythagoras and Zoroaster built up their religious and philosophic systems on these beliefs - though with some variation. In his view, these sages visited India about the time of Romulus, ‘not to instruct but to be instructed.’17 He argued that the doctrine of metempsychosis as well as the three underlying principles behind the Eleusinian mysteries - unity of Godhead, guardianship of God over His creatures, and future state of rewards and punishments - were fundamental to Hinduism and had been preached by brahmins from time immemorial, ‘not as mysteries but as religious tenets.’18 Holwell was, however, not unaware that philosophical Hinduism was incongruous with the prevalent religion of the gentoos (hindus), with its characteristic aberrations like caste, redundant ceremonials, intricate modes of worship and sacerdotal slavery. 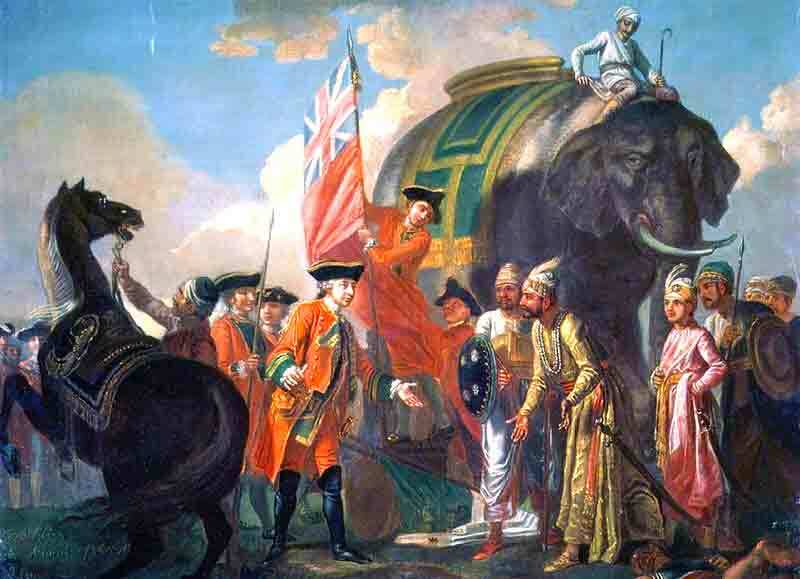 An Irish by birth, Holwell joined the service of the British East India Company in 1732 and worked in various capacities as a surgeon, member of the Calcutta Council, and as Governor of Bengal, though only for a short period. He was as much known for his versatility as for his eccentricities. His famous works include Narrative of the Black Hole which has since been seriously questioned by historians, and his account of Hinduism in three parts, published successively in 1765, 1767 and 1771, under a rambunctious title: Historical Events, Relative to the Province of Bengal and the Empire of Indostan. as also the Mythology and Cosmogony, Fasts and Festivals of the Gentoos, Followers of the Shastah, and a Dissertation on the Metempsychosis, Commonly Though Erroneously Called the Pythagorean Doctrine. Holwell's works elicited much interest in Europe. The Annual Register described his expatiations as ‘a very curious and important acquisition to the general stock of literature in Europe.’ Voltaire spoke in eulogizing terms about him and accepted his chronology of the Hindus. Guillaume-Thomas-Francois Raynal, a French clergyman, described Holwell as an apologist for even the worst features of Hinduism. Joseph Priestley an English Chemist, author and clergyman, upheld the Mosaic History against Holwell's account. So did Rev. Richard Watson who described the Hindu chronology as ‘fictitious and absurd’, ‘monstrous and asinine' and ‘a mere fable’. Coming back to the British indologists, Alexander Dow, a Scot by birth, joined the service of the British East India Company as an infantry officer in 1760. Later, he was promoted to the rank of a Colonel. Like Holwell, he was immensely interested in oriental history, literature and religion, and published many works which won him recognition; famous among them are: Tales Translated from the Persian of Inatulla, Firishta's History of Hindostan in three volumes, and A Dissertation Sur Les Moeurs, Les Usages, Le Language, Et La Philosophie Des Hindous. Dow made a conscientious effort to study Hinduism in the conviction that posterity would not forgive the British for ignoring ‘the learning and religious opinions’ of the governed, just as the present generation of Europeans was finding fault with the Greek and Roman writers for not studying the religion and philosophy of the Druids. He regretted that the European travelers had prejudiced the mind of the West against India and disgraced ‘a system of religion and philosophy, which they did by no means investigate.’ He refused to join the chorus of theologians who laid exclusive claims to the religious and moral doctrines that had been delivered to mankind by God. ‘To attentive inquirers into the human mind, it will appear that commonsense upon the affairs of religion is pretty equally divided among all nations’, he wrote. Dow's contemporaries regarded him as more learned than Holwell. His knowledge of Hinduism was considered nearly perfect. Voltaire was among his ardent admirers, and is said to have quoted from his writings. Although the Evangelicals disapproved of some of his notions, he was generally held in high regard. Born in 1751 and educated at Harrow and Christ Church, Halhed joined the East India Company as a writer in 1771. His monumental work, A Grammar of the Bengali Language published in 1778 initiated the era of printing in Bengal and made him a celebrity. After returning to England in 1785, Halhed devoted himself wholeheartedly to oriental studies and translated many works including the Mahābhārata and the Upaniṣads (from a Persian version by Dara Shikoh). These, however, remained unpublished and divested him of much credit. He died in 1830. Halhed's claims for being the first Briton to discern a link between Sanskrit and Bengali as also the first to handle the Company's correspondence in Bengali, were not without foundation. While in India Halhed inspired one of his brilliant colleagues who had been instrumental in the printing of his Grammar of the Bengali Language, to take up Sanskrit. His name was Charles Wilkins. He arrived in Bengal a year before Halhed and cultivated cordial relations with Warren Hastings who granted him study leave to go to Banaras. Hastings suggested him to publish a translation of the Bhagvadgītā, and when it was ready in 1785, appended a masterly preface to it. Other prominent works translated by Wilkins were: the Hitopadeśa (1787), Kālidāsa's Shakuntalā (1789), Jayadeva's Gītagovinda (1792) and Institutes of Hindoo Law (published posthumously in 1794). The work of scholarly civil servants, specially Jones, paved the way for ‘the philological recognition of the common Aryan origin of the main languages of Europe and Northern India, and the critical respect paid in the west to Sanskrit and its ancient literature encouraged the Hindu reforming spirit as well as a sense of inherited stature.’ 34 Along with Charles Wilkins, Jones founded the Asiatic Society of Bengal in 1784 and became its first President. The columns of the Society's Journal were used to lay before Europe the gems of oriental literature. Jones' renderings from Sanskrit into English include such immortal works as The Institutes of Hindu Law (Manusamhitā), Jayadeva's Gītagovinda, the Hitopadeśa (ascribed to Nārāyaṇa, a tantric writer of Bengal) and Kālidāsa's Sakuntlā. The last translation re-rendered into German in 1971 greatly influenced Goethe and Herder, ‘and -through the Schlegel brothers - the entire romantic movement, which hoped to find in the East all the mysticism and mystery that seemed to have died on the approach of science and enlightenment in the west.’35 Other works of Jones which won him acclaim were A Grammar of Persian Language and The Mohammedan Law of Succession. The conclusions of Jones, Wilkins and others proved beyond doubt that Hinduism was neither derivative nor a bundle of fables and superstitions but a historic faith, having a comprehensive system of ethics, transcendental metaphysics, cosmical mythology and a monotheistic base. Hinduism that had once appeared as devilish now came to be regarded as human and sometime divine. The 18th century British writers laid the foundation on which was raised the superstructure of Indology by their successors namely, Henry Thomas Colebrooke, Horace Hayman Wilson, James Princep, William Boxburg, Thomas Oldham, Alexander Cunningham, James Fergusson, F.E. Pargiter, Max Muller and many others. Their work received a fillip at the hands of many other European orientalists who made a phenomenal contribution to indological studies. Prominent among them were Anquetil Duperron, Friedrich Schlegel, Leonard de Chezy, Franz Bopp, Eugene Burnouf, Otto Von Boehtlingk, Buhler, Theodore Goldstrucker, Eugene Hultzsch, Hermann Jacobi, F. Rosen, Sylvain Levi, Rudolph Von Roth, Emile Senart and Albrechet Weber. The stage was thus set for a better European understanding of India despite the vigorous attacks of Evangelicals and the rational questioning of the tenets of Hinduism by the Utilitarians in the last decades of the 18th century. 1. See A.L. Basham, The Wonder That was India (New York, 1954), pp. 5-6. 3. See Rev A. Hume, ‘The Contact of Christian and Hindu Thought: Points of Contrast and of Likeness’ in J.H. Barrows (ed. ) , The World's Parliament of Religions, Vol.II (Chicago, 1893), pp. 1269-76. 4. J. Lockman, Travels of the Jesuits into Various Parts of the World, Vol. II (London, 1782), p. 416. 5. ‘News from the East Indies or a Voyage to Bengalla’ in A Complete Collection of Voyages and Travels, Vol.11 (London, 1745), pp. 278-79. 6. ‘A Display of Two Forraign Sects in the East-Indies, Ibid, Vol. IV, pp. 331-32. 7. A New Account of the East Indies, Vol.1 (Edinburgh, 1727), p. XXII. 8. Rabbi H. Peirira Mendes, ‘Orthodox or Historical Judaism’ in Walter R. Houghton (ed.) Neeley's History of the Parliament of Religions (Chicago and New York, 1894), p. 213. 9. D.F. Lach, Asia in the Making of Europe (Chicago, 1965), Vol. I, pp. 401-02. 10. See Michael Edwards, British India 1772-1947: A Survey of the Nature and Effects of Alien Rule (London, 1967), p. 302. 11. J. Lockman. Vol. II, pp. 241-72, passim. 12. For a fuller explanation of the idea see P.J. Marshall (ed. ), The British Discovery of Hinduism in the 18th Century (Cambridge, 1970), pp. 24-26. 13. Will Durant, The Story of Philosophy (New York, 1966), P. 238. 16. J.Z. Holwell, ‘The Religious Tenets of the Gentoos’ in P.J. Marshall (ed.) p. 46. 19. For a detailed discussion of such views see P.J. Marshall (ed.) pp. 32, 34, 35. 20. Percival Spear, The Oxford History of Modern India (Delhi, 1978), p. 69. 21. Minute by Munro ‘On the State of the Country’, December 31, 1824. 22. Alexander. Dow, ‘A Dissertation Concerning the Customs Manners, Language, Religion and Philosophy of the Hindoos’ in P.J. Marshal (ed), pp. 107-08, 138. 23. Ibid., pp. 108, 139. 25. Letter from Warren Hastings to Nathaniel Brassey Halbed, March 27, 1775. 26. See P.J. Marshall (ed. ), p. 162. 29. Sir William Jones, ‘On the Gods of Greece, Italy and India', Ibid., p. 200. 31. Sir William Jones, ‘On the Gods of Greece, Italy and India’, Ibid., p. 209. 32. Ibid., pp. 237, 257-59. 34. Francis Watson, A Concise History of India (London, 1981), p. 18. 35. Will Durant, The Story of Civilization: Our Oriental Heritage (New York, 1942), p. 372.